I was a bit surprised how cold it got during the evening, dropping to 40F by morning. I had left the windows open because it was closer to 60F when I went to sleep. Seems the weather has changed some, a cold front coming through. It would never get above 60F today, which was fine by me since it was great hiking weather. I was in the heart of the Scott Mountains in the Shasta & Klamath National Forests west of Interstate 5, on the second of six days tagging peaks on one list or another with the usual periphery bonus peaks to pad my numbers. It was still quite dark when I got up shortly before 6a. I had to drive from the summit of Forest Road 17 where I'd spent the night to Scott Mtn Summit at the top of Hwy3, about 20mi of driving on windy roads. When I got to Scott Mtn Summit, I found that the dirt road heading west around the north side of the crest was driveable by my van. This allowed me to get 2.3mi closer to the first peak and would prove most advantages for allowing me to tag a number of other peaks I hadn't planned on. Black Rock is a CC-listed summit just north of the main crest. 1.5mi of hiking on the road got me to the crest and then some, followed by another mile of cross-country. There are two main summits to the formation separated by 0.3mi. Fortunately the southern one is the highpoint and fairly easy to reach - it took just over an hour to reach its airy summit. There were a pair of nested cans lying about the summit cairn, but no register - sadness! I was all out of spare registers to leave, so the cans remained empty. I had only planned to go this far, originally assuming I would have to start from Scott Mtn Summit, another 3mi each way. Having shortened that in half, I had only begun the day. I noticed that Craggy Peak, a P1K, was about 2mi to the northwest, well north of the main crest. My route to reach it would be almost 4mi since the straightline path isn't very practical. There are easier routes to the peak from the north if one has a high-clearance vehicle, and since I don't I had assumed I'd have to leave this for another time. I now decided to head off for Craggy without any prior research other than what my eyeballs had just surveyed in a few minutes. It would be a grand adventure, one I enjoyed tremendously. I descended Black Rock to the southwest, avoiding the ridge in favor of easier ground in the forest on the SEW side. After half a mile I was back up on the main crest, heading west and southwest while roughly following the crest for another mile to bonus Peak 7,732ft. 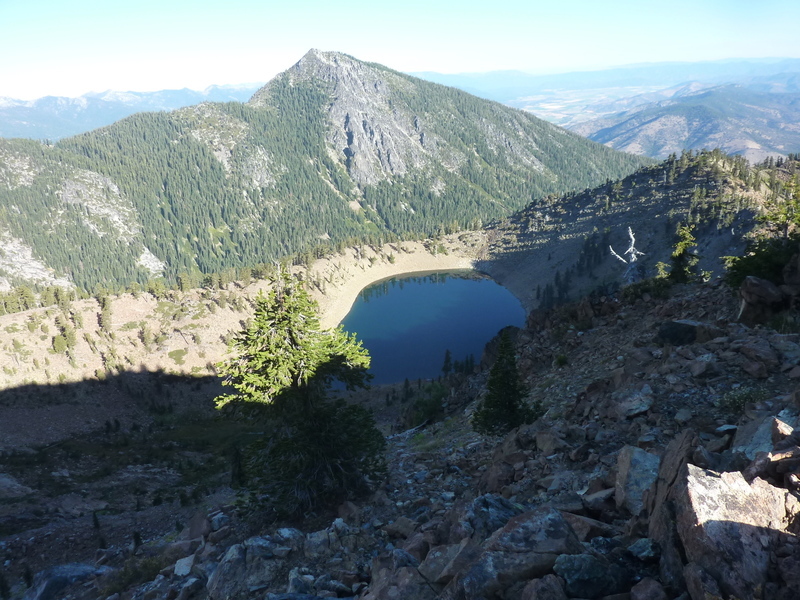 After summiting this about an hour from Black Rock, I dropped to a saddle to the southwest before descending into the basin on the north side of the crest at the head of the Little Mill Creek drainage. I could see a trail going over a saddle on ridgeline to Craggy and thought I might make use of it. As I was passing by a small pond found here, I heard the tell-tale tinkling of bells and soon spotted a small herd of cattle moving away upon my approach. I would find evidence of cows over much of the terrain I covered today - seems the small meadows and lakes that abound on either side of the crest are too good to let go ungrazed. The trail I had seen was a well-seasoned cow trail, used to move the cattle between the Little Mill Creek and East Boulder Creek drainages. At the saddle I turned and followed the ridge north, an interesting mix of forest, brush and boulders that made following it both tricky and fun. It was 10:10a when I topped out at the weak, intermediate bonus Peak 7,500ft (only 280ft of prominence). Craggy Peak was still 1.4mi to the north and this next section would take me another hour and fifteen minutes. The last 1/3mi was made particularly rough with lots of thick brush that could not easily be waded through. Some careful attention to the topography helped me find what looked to be an old use trail, or perhaps animal trail, but it seemed to favor the east side of the ridge for about half the distance before depositing me at the base of the large boulder field found just below the summit on the south side. Mixed with more brush, it was an interesting bit of brushy bouldering to get me to the summit by 11:30a. The concrete footings are all that are left of the lookout that once graced this rocky peak with a 360 degree view. At just over 8,000ft, it was the highest point I'd reach today. Though the lookout structure was gone, there was plenty of broken glass scattered about and some old rusty tins dating back many decades. Barbara and Gordon had left a register in 2001, with almost 30 pages of entries (and a few random drawings). Having had enough of the 2mi-long ridge to reach Craggy, I chose an alternate descent, dropping to East Boulder Creek. After reversing the tricky upper section, I made a 2,000-foot drop to the west through the forest, the ground littered with heaps of downfall that did their best to trip me up. Nearing the bottom, I heard the unmistakable sounds of several dogs barking up from below. I couldn't see them, but they must have been alerted to my presence. I cut left to avoid them, using a deer trail to traverse the side of the hill away from their barking. I then heard what I thought was East Boulder Creek, but instead of water, it turned out to be the sound of machinery. Through the trees below me, I could make at several men in hard hats working away. Logging? Better not go down there either, so more traversing ensued. Eventually I dropped to the tread of a new trail being constructed, not logging as I'd thought. I followed this south until it made a switchback to the north. A use trail continued south so I followed that to a junction with an old road, then followed the road until I met up with the East Boulder Creek Trail. This worked nicely to get me up 600ft to East Boulder Lake in about a mile and a half. I could have followed this trail around the lake, up and over the crest to the PCT on the south side, but southwest of the lake rises bonus Peak 7,747ft and it seemed too close to pass up. I hiked up steep slopes for 900ft to gain the peak's NW ridge, and followed this more or less to the summit. It was just shy of 2p when I happened to notice yet another peak about 1.5mi further to the southwest. A check of my GPSr showed this to be Eagle Peak, this one on the TAC list (a collection of peaks found in Wayne Moss's Trinity Alps Companion). Again, too close to let it go. Another 45min would be spent getting to this last summit. It was made easier by a section of the PCT I came across while following the crest that let me use the nice trail for almost half a mile. The last 1/3mi to the summit from the PCT was up modestly steep, mostly open slopes under forest cover. The register I found at the top crag was jammed full of papers and odd items. Two books dated back only a few years but were filled with entries. It seems there is a youth camp somewhere around here, as most of the entries are from campers and staff expounding on the wonders of camp and Eagle Peak. It was nearly 3p by the time I had descended back to the PCT, my trailhead more than 5 air miles away. Luckily the return could be made all on the PCT (and the road at the end) without losing or gaining too much elevation along the way. I was treated to some fine views looking south into the Trinity Alps Wilderness, with a few peaks I'd climbed recognizable, most others not. I didn't return to the van until nearly 5:30p and I was pretty spent, having done 20mi with more than 6,000ft of gain. I had planned to return to Scott Mtn Summit and climb Scott Mtn on the east side of Hwy3, but that would have to wait until the next day. I would simply camp for the night near the start on Hwy3 and do this one first thing in the morning. A very fine day indeed!